What’s special about the Hidden Valley? Well, it’s actually hidden for a start. And it just so happens to be hidden in a stunning wilderness, the Budawangs. Walking into it is like finding a lost kingdom. 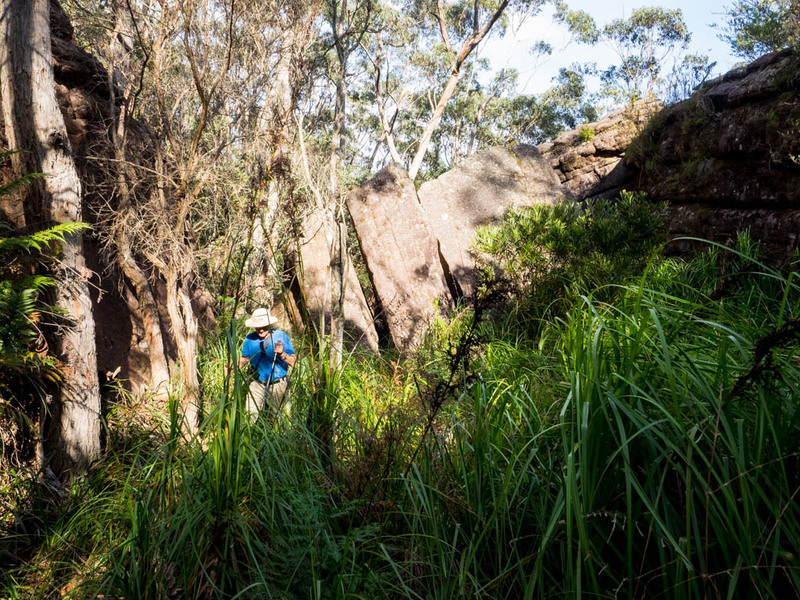 The Budawang Range, an outstanding and rugged patch of wilderness south-west of Nowra, was once the domain of hardened and foolhardy loggers and graziers. 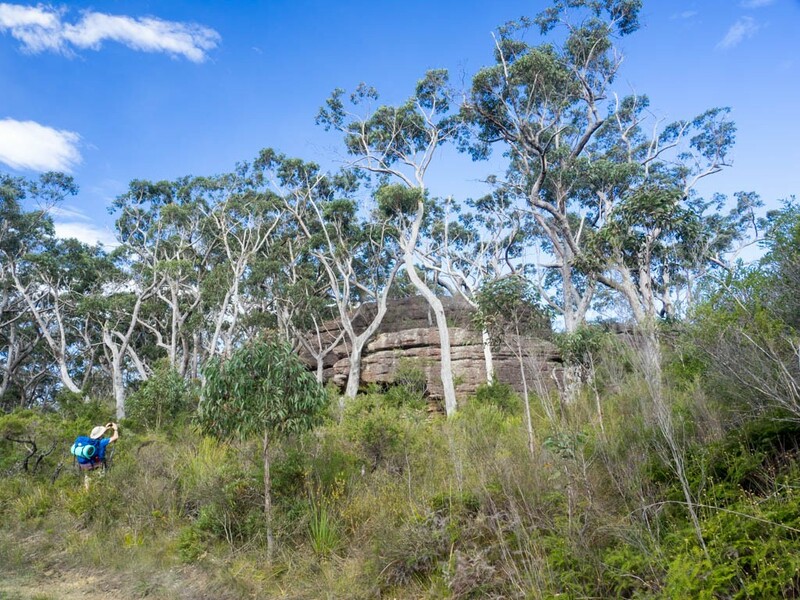 Within the national park, their traces remain in the form of trails, peak names and structures slowly being reclaimed by bush. Art sites, notably the bora circle on Quilty’s Mountain, and archaeological remnants like axe grooves and ancient camp sites are reminders that for at least 11,000 years before the Anglo incursion, the Wandalinian and Walbanja people had made the Budawangs their hunting grounds and sacred places. Now it’s predominately wilderness, dominated by rounded sandstone mountains and thick forest, with few facilities other than fire trails and some picnic areas at the entrances. 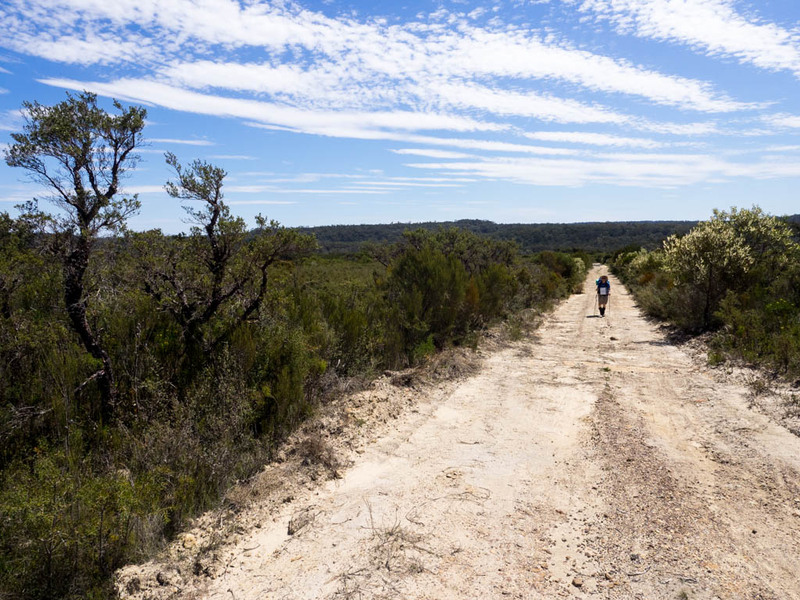 The Sassafras entrance is hard to find if you don’t know what you’re looking for: there are no signs, only the guidebook’s description of early grazier Jim Sturgiss’s slab hut, which stands opposite the gate. After a couple of drive-bys, my Dad and I finally found it, thanks to some coloured tape wrapped around a post. We then bumped down a very rough track – barely passable for 2WD vehicles – and began our 3-day walk to the famed Hidden Valley. 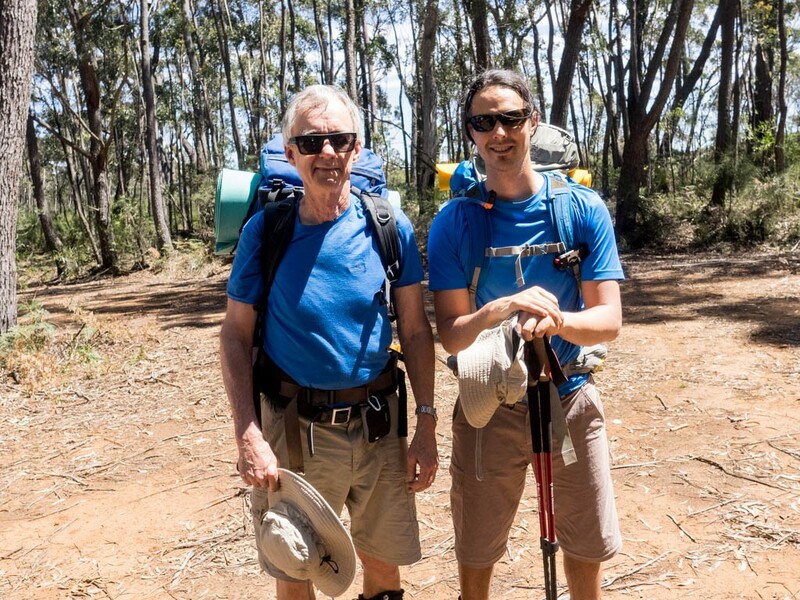 Before setting out, I had sought some insight from my workmate John, a lanky engineer in his 50s who had walked (and bush bashed) much of the Budawangs. After more than an hour in the full heat of a 30+ degree day, I was beginning to think John was right. The afternoon sun was as relentless as the classic sandstone heath country was monotonous. Thankfully there was a steady breeze and small variations to the landscape, like a copse of banksias bordering a small swamp where we could hear the rhythmic call of frogs. Eventually, we got glimpses of the steep cliffs overlooking the Clyde River valley. 6km on, we finally left the ridge and descended into forest. My expectations of the walk had been set by previous walks in the northern sector of Morton National Park, near Bundanoon. Here, high plateaus drop off sharply into deep valleys and gorges, with spectacular outlooks such as Fitzroy Falls. In the Budawangs, the landscape revealed itself more gradually. Stone monoliths started to emerge from between the gum trees, their eroded, horizontal lines reminiscent of the Kimberley’s iconic Bungle Bungle stone formations. Each stone had its own character and it felt as though we were watched over by elders – a feeling that would only grow over the next two days. 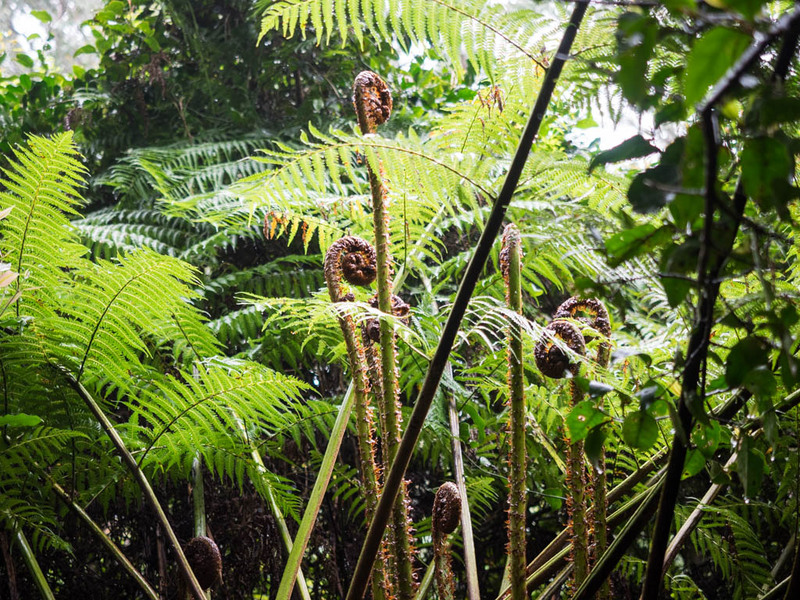 We walked through the remnant rainforest of The Vines – a silent and dark enclave of twisting vines, trees and tree ferns – before we left the service trail finally and headed down a disused logging track. 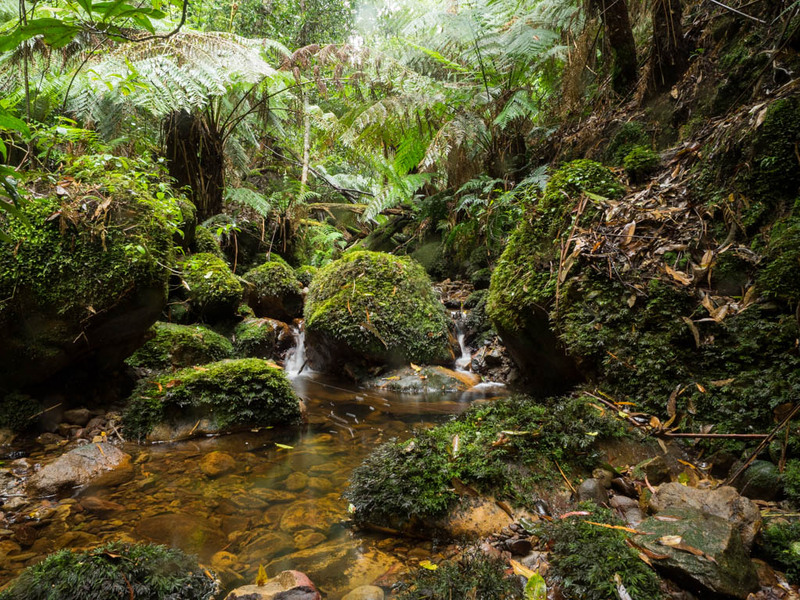 For the most part, we skirted steep creek gullies through wet sclerophyll forest, ducking over and under fallen logs and through short rainforest sections. The spirit, or perhaps desperation, of the loggers who worked these rough trails felt unfathomable. To our right, Quilty’s Mountain was hidden by forest canopy though sections of its immense plateau dominated the skyline whenever the trees thinned out. Eventually we crossed a small creek in a lush gully and climbed the steep hillside to our campsite. 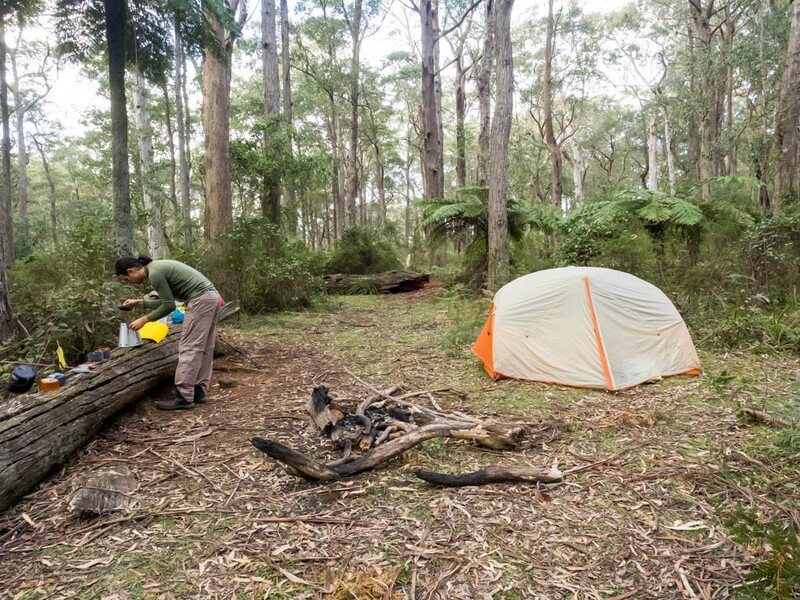 Marked by an impossibly tall tree fern inscribed with the initials HV and a fallen log, the turnoff to the Hidden Valley hosts an established bush campsite, with a fire circle and space enough for a few tents. But there was no sign of the nearby water that I had read about in Ron Doughton’s Bushwalking in the Budawangs. After a few unsuccessful reconnaissance missions we ended up doing the 2km return trip to Styles Creek. 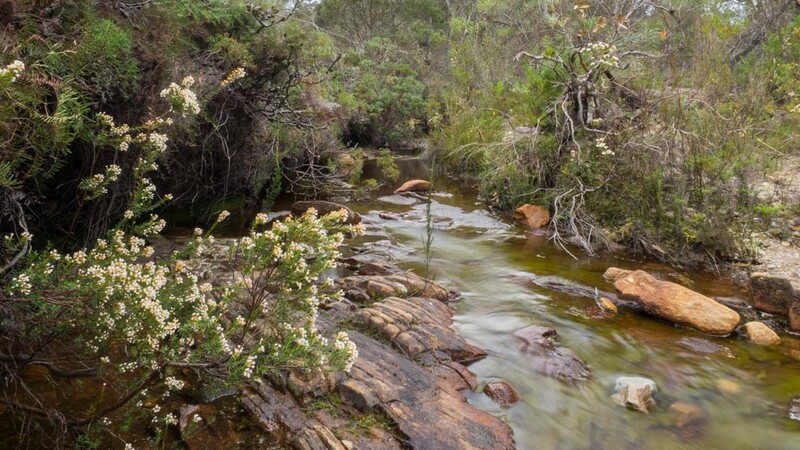 Styles Creek runs through the northern edge of an open, heath plain, bordered on all sides by ancient, eroded mountains: Mt Hoddle and Mt Haughton to the south, Quilty’s Mountain’s to the north-west and Mt Sturgiss to the north-east. This would have been a great campsite too, especially at dawn and sunset when this natural amphitheatre is bathed in shadow and light. From here, it was also possible to appreciate just how vast Quilty’s Mountain actually is, its striated cliffs rising out of the forest above us. The dawn of day 2 was subtle – only patches of sunlight penetrated the thick forest canopy around our campsite. Soon enough we were en route to The Hidden Valley, following a weaving path up a slight incline. After 15 minutes the track reached a small cliff line – maybe 25 metres high – and we found water, a soak running in drips down the cliff face, landing in a small pond. It was a magical fairy-like oasis in the midst of the dry forest. The Hidden Valley merits its name: we had no inkling that it lay beyond the cliffs. If it weren’t for track notes and maps, we would have never found it. But soon enough we came to a cleft between some flat, upturned boulders. It was if we had walked through a portal: crossing a small patch of tall swamp grasses felt like entering the hanging garden of some ancient kingdom. Hi James. Sounds like a nice little bushwalk. Where did you get the route description? Is it all detailed in Ron Daughton’s book? Thanks. Hi Dan. Yes, it is fantastic, except for the fire trail at the start/end, which is pretty tedious. 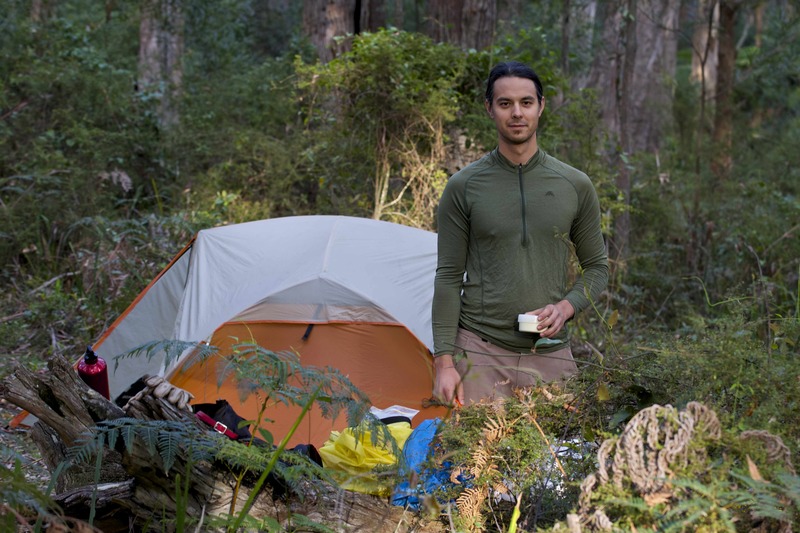 I enjoyed setting up base camp in the bush and then doing day walks to the Hidden Valley, etc on Day 2. You’re right, it is in Ron Doughton’s book: main notes are for walk 30 (Sassafras to Hidden Valley return) but you’ll want to refer to his notes on Walk 32 for climbing Mt Sturgiss and finding Dark Brother’s Cave. Let me know how you go. 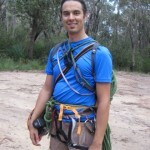 Also, not sure if you had a read of Part 2 of this story, which talks about the Hidden Valley itself: http://thelifeoutdoors.com.au/hiking/into-the-hidden-valley-walking-the-budawang-range-part-2/. 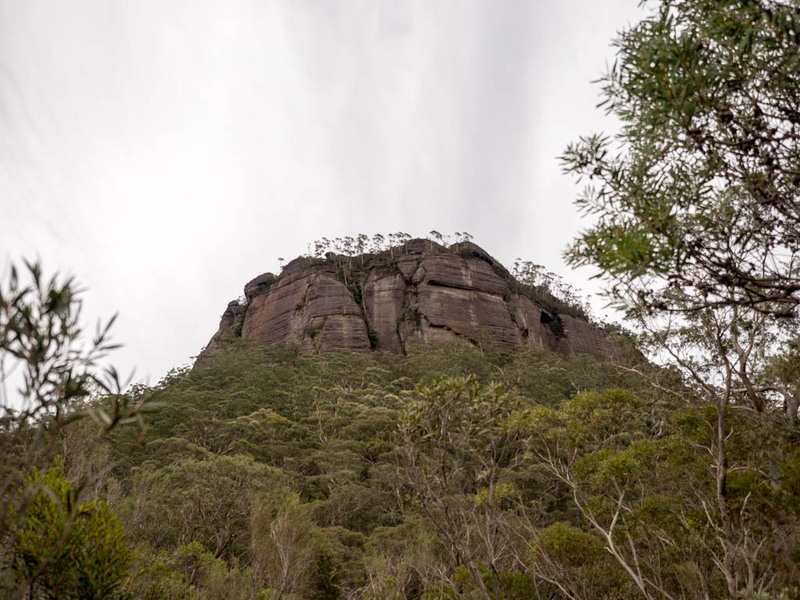 It is an amazing spot and worth the walk in… I’d love to go back one day and enter the Hidden Valley via Mt Sturgiss, thought that’s much more of an adventure. On my most recent hike there, with a former colleague, we actually rode our bikes in part of the way and then stashed them near Newhaven Gap, before continuing on foot!